Although both the yellow metal and related equities have continued to rise, something is conspiring to keep a tight lid on the rally. And no, it isn’t a wide reaching and vast conspiracy involving central banks, hedge funds, the Easter Bunny and Mossad. Last week, gold sentiment skyrocketed to 81% - as measured by MarketVane’s Bullish Consensus. That is the highest it has been this year and not too far off historic extremes. According to contrarian analysis, there is way too much excitement about this little latest rally. When the vast majority of those who are interested are bullish (and act on the opinion by buying) the tragic conclusion is that there isn’t any real buying pressure left to propel prices higher. This is what happened last May when bullish gold sentiment reached a crescendo of +90%. Gold peaked at $725 and the AMEX Gold Bugs Index (HUI) at 400. Neither have seen those levels again. And if the bullish sentiment continues, there is less and less probability they will. The only argument that I can see for a continued rally in gold is the bullish percent index for the sector. According to the BP index kept by Dorsey, Wright & Associates, there is a possibility that we could see gold break out from this multi-year trading range. In mid August, along with the rest of the market, gold got clobbered. That caused the bullish percent for the index to fall to 16% - a very, very low number. So far, it has recovered from this depth to 30%. As you can see from the chart (below), the BP index has quite a ways to go before it reaches overbought territory. So take your pick: keep gold longs because bullish percent is still quite low or pare positions and tighten stops because sentiment is getting too bullish. Personally, I’m going with sentiment - via contrarian avenue. * BPI for PM: oversold under 30 and rebounding, buy. 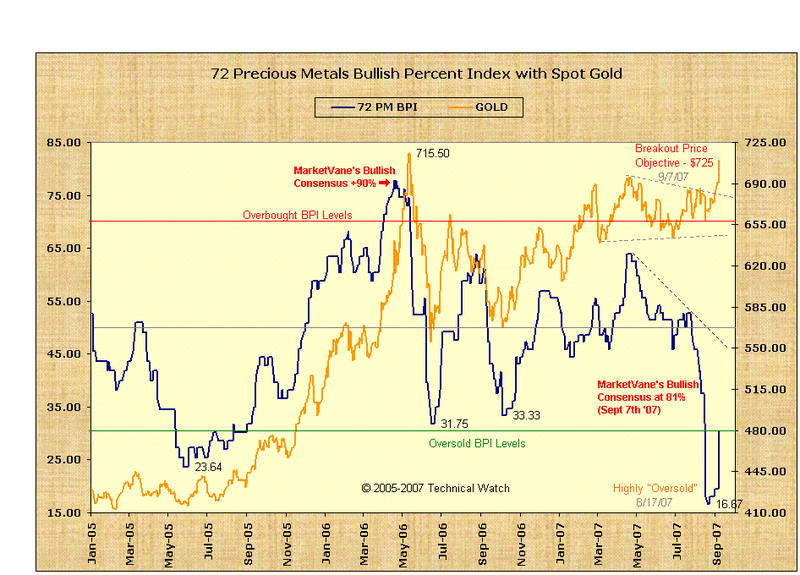 Besides, I say: if there is to be a bullish rally soon, as Teeun Draaisma, Hulbert’s newsletters, comercials, Investors Intelligence and insiders are telling us quite clearly, gold and gold bugs might benefit also. No need for any 2007 crash and safe haven myth for that. As for the markets, I think the easing in 3m Libor today is one of the most interesting news I’ve heard recently concerning credit crunch. unless I see a clear case for taking BC as predictive I’ll interpret it as contrarian. but you’re right, the picture looks at best mixed or muddled for gold. what happened in the libor market? I’m afraid I didn’t get this story. Hi. Yes, I know about BC. I read some discussion here about it. As for the 3 months Libor, today close has been quite relaxed. This is important having in mind the maturing of 113.000 mill euros in comercial paper. While the 1-day rates had relaxed yet, today they were below the official 4%, the 3 months Libor rates were stubbornly tightened. In fact, there is a mix of positive signs about credit crunch today. The BoE has relaxed his conditions for the banks reserves. Yesterday some banks launched corporate debt again (i.e. samurai bonds of Deutsche Bank). The FED has reported about comercial paper and it was not so bad as it were. This, in the context of the 113k mill eur maturing, are good news about credit “constipation”. (btw, there was also the First Data buyout, and I don’t know how is it going). In 6-12 months span they saw a bullish potential of 12% for MSCI Europe (obj.1750), up to 21% in the more bullish scenario. Since their bullish call the MSCI Europe is 7,7%. Their preferred sectors are tech&telecom, health, finances. They don’t like consumer sector. They speculate that, if credit crunch crisis is happyly overcome, it might develop a “epic-euphoric” bullish market with a “undestructible bullish trend” attitude, strong participation of retail investors, and the like. In a word, the terminal stage of this bullish market. Their alternative, less probable bearish scenario would be one with markets falling -50% up to -70%. Finally, the least probable scenario would be a muddle-through one. Gold is on fire…just looking at the GLD this morning (20 September 2007) and it’s up big. What a crazy parabolic shot up.